Tony Hsieh is CEO of online retailer Zappos and author of Delivering Happiness: A Path to Profits, Passion, and Purpose, a #1 New York Times best-seller. You can also find him on Twitter (@Zappos) and working with community leaders in Las Vegas to rejuvenate the city. 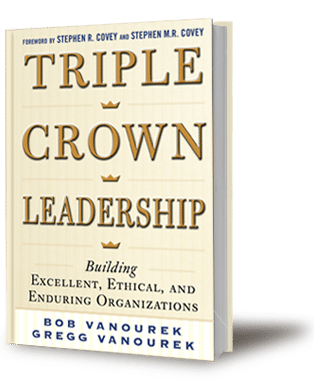 Here are excerpts of our interview with him for Triple Crown Leadership. Hsieh: We have a strong belief that in order for employees to want to stay with the company long-term they need to be continually learning and developing both personally and professionally. We have a team here called the “pipeline team.” The vision for them is that almost everyone that we hire will be entry-level. We will provide all the training and mentorship to new hires, so that within five to seven years they can become a senior leader within the company. We call it the “pipeline” because we want to get to the point where there will be employees at every stage along the way in that progression. Part of the reason for doing that is so that every employee always has an opportunity to learn and grow. Another reason is to protect our culture. It’s a lot safer training and developing someone who started out entry level than it is to bring in someone senior who may not necessarily be a fit for our culture. Then we are not really dependent on any one person. You can take anyone out from anywhere in the pipeline, and there is always someone to step up and take that person’s place. Hsieh: My role is to get everyone in the organization aligned around the same values and long-term vision of the company. The ideas, implementation, and execution really should be driven from the bottom up. around the same values and long-term vision of the company. How would you describe Zappos’ culture? Hsieh: We have ten core values. That is a formalized definition of our culture. Many companies have core values or guiding principles, but usually they read like press releases, and they are very lofty sounding. Maybe you learn about it in day one of orientation, but it just ends up being a plaque on the wall in the lobby. We wanted to come up with a list of core values that were actually committable. By committable, we mean we actually hire and fire people based on each of those core values. We have interview questions for each of the core values, and we do two sets of interviews. Our hiring team does a standard set of interviews looking for relevant experience, technical ability, and so on. Then our Human Resources department conducts interviews specifically for culture fit, including things like humility, fun, and weirdness. Recruits have to pass both. We’ve passed on a lot of really talented people who could have made an immediate impact on our bottom line. If they are not a culture fit, we won’t hire them. • On a scale from one to ten, how weird are you? • When was the last time you broke the rules/policy to get the job done? • Tell me about a time you recognized a problem/area to improve that was outside your job duties and solved it without being asked. What was it, how did you do it? And the reverse is true too. Even if someone is doing their specific job function fine, if they are bad for our culture and not living up to the core values, then we will fire them. you are living or inspiring the core values. If you had to use a few words to describe the culture, what would those words be? Hsieh: I think the number one thing is that we are a family atmosphere. Most people when they leave the office end up leaving to hang out with other Zappos employees. It’s a fun and creative culture. How has the culture has been built, and by whom? Hsieh: Employees have really generated it. When we first wrote out our core values, we actually went through a year-long process where we just asked our employees what should our core values be. Everyone emailed me their ideas, and I combined them. Then we went back and forth and eventually came up with our list of ten core values. Zappos is now famous for emphasizing organizational culture. What led you to take that approach? Hsieh: We always have realized that culture is important, because we wanted a place where we enjoyed going into the office. We realized several years ago that, as we were growing and hiring so quickly, not everyone had the same idea of the culture or the characteristics of people who would be a good fit for our culture. That’s when we decided to ask everyone in the company to help us define our culture in terms of values. It was really the whole company, because we wanted everyone involved. How does this culture impact the various stakeholders? Hsieh: We really want the customers who call us to feel like they have a personal, emotional connection with us. So, we don’t have scripts or call times for our customer service reps. The only way that’s going to work is if the customer feels like the employee on the other end truly cares about delivering great customer service. The employees are only going to care about that if they’re engaged and happy, and if they understand our long-term vision for the company. People are generally happy to be here, and then customers can sense that passion over the phone. When vendors come and visit, they can sense that passion. So, it has a snowball effect. How about your vendors? Does this culture spill over and affect them? Hsieh: We treat our vendors as partners, and they help us co-manage the business. They usually have the same access to the information that our own buyers have access to. They can view on-hand inventory, our turn, markdowns, sales and so on. We really just view them as extensions of the family. How have you handled breaches in the organization’s values? Hsieh: Living the values and inspiring others is just part of the job description. If you are not doing your job that you were hired to do, then initially there will be some coaching and possibly being put on an action plan. If it still doesn’t work out or improve, then ultimately we end up firing the employee. What kinds of things have employees been fired for? Hsieh: For example, if you are merchandising, and you are not making your sales numbers on a consistent basis, then you are not doing your job as a merchandiser or buyer. Or if you are someone who really doesn’t work well with teams, and you are more of a superstar and individual performer, who really rubs people the wrong way, then that’s clearly not in line with our core values of fostering a team and family atmosphere. Ultimately, what matters the most is alignment with our core values, and I think you can only get that through integrity. How does your personality profile show up in your leadership? Do you lead with a hard style, or soft style, or try to be versatile? Hsieh: I guess I would say my hard-edge style really comes about when it’s making sure that we are doing things that are in line with our values and our long-term vision. For pretty much everything else, I try to have the decision-making come from as close to the front lines as possible, because those are the ones who are actually talking to our customers. As long as they understand the long-term vision and our values, I think it makes much more sense for them to be the ones who come up with the ideas. There are different ways of being a leader at all different levels. We definitely try to encourage people to step up. Are there authority levels that are delegated? Can a call center employee make an adjustment up to, say, $500, but over $500 he has to seek a supervisor’s approval? How do you handle delegated authority levels? Hsieh: For the most part, pretty much anything that I can do for a customer, all of our reps are empowered to do the same thing. What does it feel like to work at Zappos? Hsieh: I guess it just feels right. A lot of people talk about having this separation between work and personal, and that’s usually because work is not enjoyable. For us, Zappos is really more of a lifestyle where when you go out and have dinner or drinks with your friends. It’s not meant to be a meeting. It’s meant just to hang out, but work stuff always comes up, and, usually, that’s where the best ideas come from. Ultimately, if you are doing something where it doesn’t feel like work, I think that’s when you’ve found the right thing.